Nine Elms Station was designed by Sir William Tite as the London terminus of the London and Southampton Railway and was opened in 1838. Joseph Locke was the chief engineer of the line which was build by Thomas Brassey. Just nine days after the opening, eight special trains ran to Epsom and carried more than 5,000 people to the Derby. 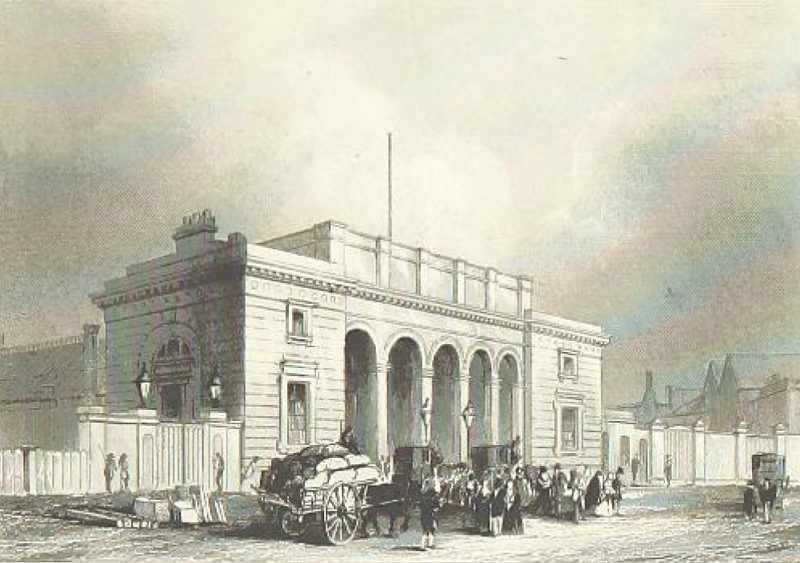 The station closed in 1848 when the line was extended to Waterloo. Occasionally the short-lived station was used by Queen Victoria and other VIPs. During 1941 the station was damaged by German bombers and finally demolished in the 1960s to be replaced by the flower section of the New Covent Garden Market in 1974. In June 1850 an Italian invention, the Impulsoria – a horse powered locomotive – was tested at Nine Elms. Clemente Masserano’s invention was also tried out at the Crystal Palace Exhibition in 1851. “A quaint thing happened at Nine Elms in 1850, suggesting that there were still many who believed money could be saved by scrapping steam and, by mechanical transmission, getting much more out of a horse than Nature had put into him.”Clemente Masserano, a Piedmontese, brought from Italy a thing which he called an Impulsoria. Briefly it comprised a 2-2-0 locomotive frame and wheels bearing an endless moving platform on which two horses trotted.”It had a multi-speed gear formed by slip pulleys and ropes … Massearno, having got the ears of the South Western directors, pointed out to them that horses cost two shillings a day while steam locomotives burnt sixpennyworth of coal a mile, and was smilingly given a break at Nine Elms.